Forest Swords offers a dazzling, evocative album that acts as the perfect soundtrack to the precarious times we live in. 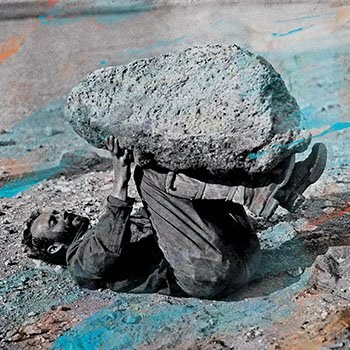 Forest Swords’ 2013 album Engravings was acclaimed as a bold, singular album that wove dub, house, and ambient rock into a triumphant and emotional avant-garde electronic album. This follow-up, Compassion, sees the man behind the Forest Swords moniker, Merseyside-based producer Matthew Barnes, expand on that template and straighten out many of the more jagged edges that characterized Engravings to leave a more outward looking, atmospheric offering which is no less thrilling. Opener “War it” cleverly articulates the foreboding feeling of forthcoming battle. Rather than the drama of a summer blockbuster, this is a daunting, mournful soundtrack to conflict featuring yawning, cinematic atmospherics. The percussion pops and crackles like the sound of distant gunfire before Barnes makes room for a rich interplay of keyboard riffs. Before long, cascading notes heighten the tension still further before suddenly stopping, like the sudden cessation of hostilities. “The Highest Flood” continues in the same vein but, if anything, mines down even further with deep rumbling synth lines and repetitive, pointed choral chanting. The epic “Panic” expertly evokes the confusion and trepidation of modern life. When discussing the song, Barnes has described the song as “the point where tension and stress boil over into a sort of euphoria". This feeling is powerfully evoked using a chiming, coruscant xylophone that gives way to an ominous, cramped, rolling beat that frames a Middle Eastern style vocal melody. The song also features one of his clearest vocal samples yet as a crystal clear, desolate voice intones “I fear something’s wrong / Panic is on.” It’s a bleak conclusion to the song which allows the listener a moment of reflection. It’s not as if the tension lessens in what follows, but there is a marked softening of mood. “Exalter” features bursts of distorted vocals and single piano notes that hint at a more positive outcome, feeling like a bridge that has to crossed to reach that state of euphoria, Barnes mentioned in his description of “Panic”. This feeling continues into “Border Margin Barrier” which is a much subtler, restrained piece like the slow, measured breath of someone looking for calm. It expands and surges with choral singing before tiptoeing away again. Along with “Arms Out” it demonstrates beautifully Barnes' ability to tap into the emotions and pull on the heart strings using evocative vocal samples. In addition, the use of samples highlights Barnes’ uncanny ability to seamlessly knit samples together as he consistently blurs the lines between old and new. The spell is soon broken by “Vandalism” as Discordant, twisted sax settles into an incessant buzz like a bothersome insect swirling around your head. The stomp of clattering beats that echo and reverberate suddenly feel like that one insect transforming into a swarm. “Raw Language” brings back the magisterial, classical strings but Barnes takes them somewhere new as it evolves into an atrophied jazz song. Off-kilter sax weaves its way in and out of the mix and Barnes creates stepping stones out of multi-layered vocal tracks that eventually spin and clatter together. It all finishes with the plaintive piano of “Knife Edge” which ebbs and flows like the tide. It is neither a somber or hopeful ending, as the title suggests the situation we find ourselves in at this point in time is still very much in the balance. Barnes has created an expressive atmospheric album that resonates with emotion both positive and negative. Often songs feel claustrophobic and confined until a single note or riff signals a change to something altogether more expansive and panoramic, like opening the door to a dusty room that has been shut up for years. He paints in broad strokes on a vast canvas to create broad, far-reaching, soundscapes that are as confounding as they are hypnotic. What is even more impressive is how balanced the tracks are with nothing sounding overstuffed despite the obvious overspill of ideas going into each one of them. Overall, this is a dazzling and unique album that often veers from reassuring to disconcerting in the space of a single track.